The RL34 was designed with the Queensland Barrier Reef very much in mind. She is a boat that will sail well in the steep short seas that prevail in the area, be able to negotiate shallow entrances, and sail right up to the beach. 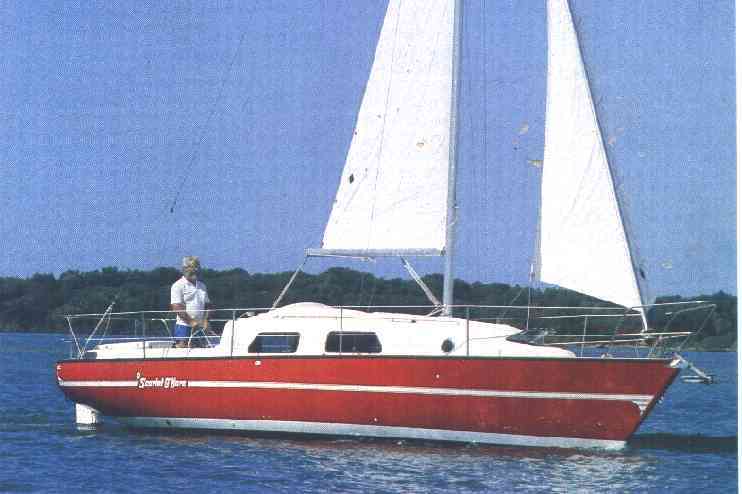 Her easy lines and clean run make her very easily driven in the worst chop, and drawing only 500mm (a little over knee deep) with the keel retracted, she can sai1 or motor into coves or creeks, where a conventional keel boat cannot go. She was designed to be powered by a MD7B (17.HP) Volvo diesel conventional drive, which is located under the cockpit floor. The aft cabin can either be used for sleeping (two pipe cots), or as an excellent storeroom for extended cruising. Her long flat iron ballast keel allows her to take to the bottom if necessary. The 3/4 rig is moderate, keeping in mind that winds all along the Australian coast are mostly fresh, and the Keeley KA10 mast with single spreader is very adequately supported by caps and lower shrouds and adjustable backstay. Fitted with a storm cover and canopy over the roomy cockpit she will provide her crew with good protection when needed from rain, wind and sun. Headroom in the main saloon is nearly 2 metres, and combined with her excellent accommodation makes the RL34 a very comfortable boat. Her sailing ability and overall concept has exceeded expectations and it is good to know when called upon, has proved herself capable of beating much larger boats offshore. Comfortable accommodation from 5 to 8 Adults.